There’s a lot of iron in our mountains. That fact reveals itself in names – Iron Creek, Iron Springs, Iron Cap, Iron Gate, Iron Mountain, and Iron Peak. The last two entries would appear to be the same hill but although they rise near each other and are only 9 miles apart, they are quite separate mountains…or peaks. 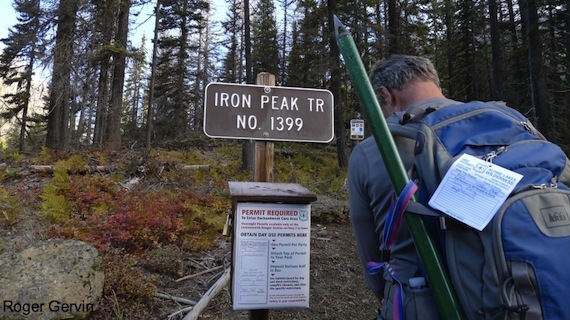 Iron Peak, the topic of this guidebook entry, is accessed from the North Fork of the Teanaway River and is slightly out-of-area — it’s a bit more than an hour’s drive from the Y-Junction near Leavenworth. Nonetheless Iron Peak, 6510 feet, feels like a local peak with its in-your-face views of our local peaks: Stuart, Sherpa, Colchuck, Dragontail, and Little Annapurna. For even better views, combine the hike up Iron Peak with a scramble up Teanaway Peak, the 6,779-foot peak accessed from the same col used to climb Iron Peak. Check out Roger Gervin’s photo gallery of Iron Peak from October 10, 2013 for a vision of the surroundings that will have you wanting to plan a trip. Skill. For hikers: Iron Peak 2 (intermediate), and Teanaway Peak 3 (advanced). Mountaineers would rate these peaks as easy climbs (1) from a technical standpoint. Distance. About 7.5 miles round trip to climb Iron Peak. 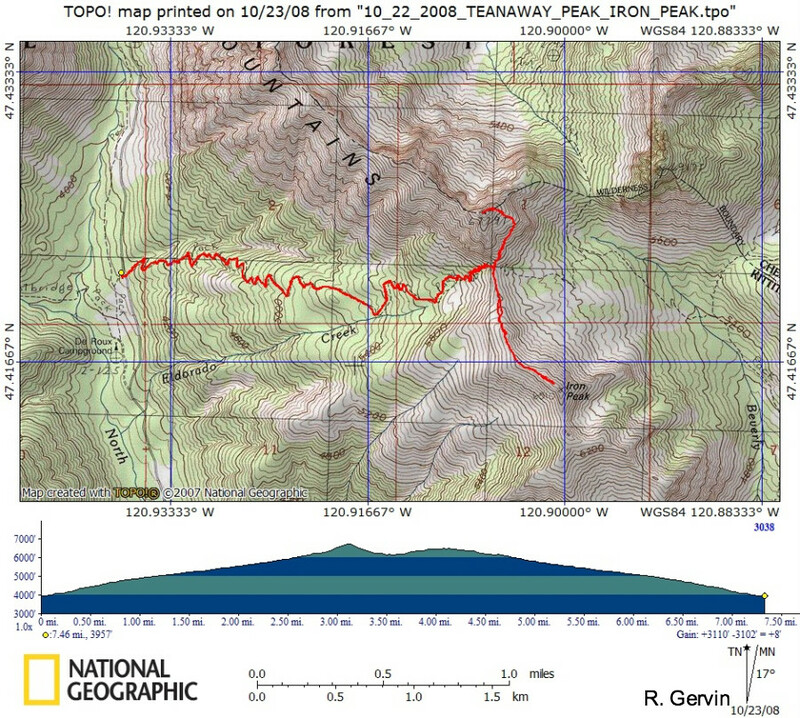 Climbing Teanaway Peak adds about another three-quarters of a mile (round trip) of steep walking to the day. Elevation Gain. 2,600 vertical feet. Tacking Teanaway Peak onto the day adds another 600 vertical feet of climbing to the outing. 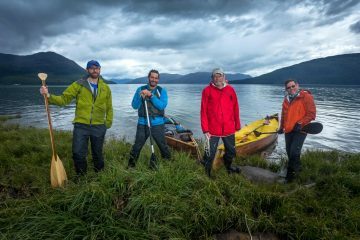 Recommended Seasons. Summer and fall. Access. Take Highway 97 South and continue onto 970 West. Turn right onto Teanaway Road and continue to Teanaway Rd North Fork. From the 29 Pines Campground, follow the North Fork of the Teanaway River along Road 9737 toward the Esmeralda Trailhead for a bout 9 miles to the trailhead. The Iron Peak Trailhead will be on the right side of Road 9737 with a little bit of parking on the left side of the road. Northwest Forest Pass required. This is a simple one. Hike the trail uphill for almost 3 miles to the saddle at the 6,140-foot level. Hang a right here and walk about 0.7 miles along the peak’s north ridge to the summit (6,510 feet). Return the way you came. 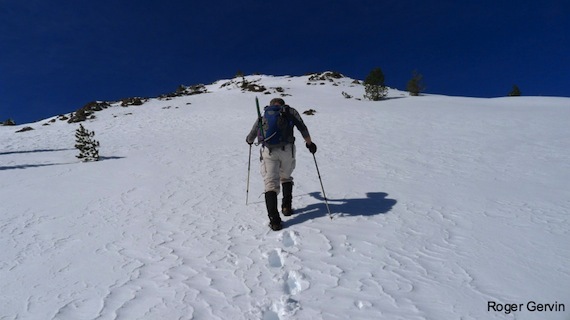 If you want to climb Teanaway Peak, head north from the saddle and climb the steeper south ridge to the the 6,779-foot summit. Land Ownership. 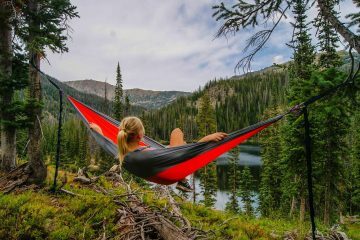 Okanogan-Wenatchee National Forest. Fees/Permits. Northwest Forest Pass required.